Can we predict the prognosis of COPD with a routine blood test? Background: The major characteristic of COPD is systemic inflammation. The parameters such as neutrophil-to-lymphocyte ratio (NLR) and eosinophil-to-basophil ratio (EBR) in routine blood test (RBT) are considered to be the underlying biomarkers of inflammation. We hypothesized that the prognosis of patients with COPD can be predicted with RBT. Methods: Patients with COPD in stable stage were enrolled. The RBT, pulmonary function testing (PFT), BODE index, C-reactive protein (CRP), procalcitonin, and erythrocyte sedimentation rate (ESR) were performed at enrollment and every follow-up once in every 3 months during the 24-month follow-up period. Meanwhile, exacerbation count and mortality incidence were recorded. The correlation between the prognostic biomarkers and the prognosis of patients was analyzed. Results: The NLR and EBR in RBT have a significant correlation with the severity of patients with COPD. The NLR is an independent predictor for mortality and the EBR is an independent predictor for exacerbation. Conclusion: As an inexpensive, accessible, and convenient assay, RBT may be used as a practical means in the prediction of prognosis of patients with COPD in future clinical settings. COPD is a global public health concern and is currently the third leading cause of death worldwide. It is a common, complex, and heterogeneous condition, which is responsible for considerable and growing morbidity, mortality, and health care expenses worldwide.1,2 Exacerbations of COPD indicate instability or worsening of the patient’s clinical status and progression of the disease and have been associated with the development of complications, an increased risk of subsequent exacerbations, a worsening of coexisting conditions, reduced health status and physical activity, deterioration of lung function, and an increased risk of death.3 Once the diagnosis of COPD has been made, the prediction of the prognosis such as exacerbation or mortality seems to be of vital importance; however, in some primary health care settings with inferior approach of examination, the evaluation of prognosis seems to be a mission impossible. In recent years, the neutrophil-to-lymphocyte ratio (NLR) in peripheral blood has drawn attention as a potential systemic inflammatory biomarker. NLR has been used as an independent prognostic factor in various solid tumors, including lung cancer, colorectal cancer, pancreatic cancer, breast cancer, ovarian cancer, and gastric cancer as well as various cardiovascular diseases.5 In 2014, Guany et al6 found that NLR could be considered as a new inflammatory marker for assessment of inflammation in COPD patients owing to its quick, inexpensive, and easily measurable property with routine complete blood count analysis. Later, several studies on NLR and COPD showed that NLR was associated with airflow limitation, disease severity, exacerbation, hospitalization, and all-cause mortality in COPD patients.7–10 Eosinophils are end-stage cells derived from the bone marrow under the influence of granulocyte-macrophage colony-stimulating factor, interleukin (IL)-3 and the late differentiation factor IL-5.11 Saltürk et al found that noneosinophilic COPD exacerbations can be more severe with a higher APACHE II score and more sepsis-related complications. As such, noneosinophilic COPD exacerbations have a higher rate of noninvasive mechanical ventilation failure, a longer length of intensive care unit stay and a higher mortality rate.12 In terms of their ontogeny, eosinophils are closely related to basophils rather than neutrophils or monocytes.11 However, basophils are considered to be responsible for inducing inflammatory reactions during immune response such as nephritis in lupus.13 In that case, since it appears that both low eosinophil and high basophil can lead to the deterioration of COPD, we postulated that the eosinophil-to-basophil ratio (EBR) is possibly positively correlated with the favorable prognosis of COPD and vice versa. For other parameters in routine blood test (RBT), Tertemiz et al14 indicated that the increased red cell distribution width (RDW) values were related to underlying chronic inflammation, which promotes red blood cell (RBC) membrane deformability and changes in erythropoiesis. Since systemic inflammation is persistent in COPD patients, we hypothesize that the parameters such as NLR, EBR, or even RDW, RBC, and hemoglobin (Hb) in RBT can possibly be used to predict the prognosis such as exacerbation or mortality of COPD. Although there have been several studies regarding the correlation between the prognosis and NLR as well as eosinophils in patients with COPD, few of them were comprehensive, none of them involved the other parameters in RBT such as EBR, Hb, and RBC meanwhile, the results of them are not exhaustive. Therefore, the purpose of this study is to clarify the correlation between the prognosis of COPD and several basic biomarkers in RBT in order to find out whether RBT can be helpful for the prediction of outcome of COPD. It would be significant if such function of RBT could be proved for patients with COPD. This prospective, multicentered, parallel-group, case–control study was performed from July 2014 to July 2016. The inclusion criteria and exclusion criteria are shown in Table 1. The flowchart showing the enrollment, screening, follow-up, and outcome of this study is depicted in Figure 1. The participating institutions included Shanghai Gongli Hospital, Shanghai Punan Hospital and Shanghai Renji Hospital. Figure 1 Enrollment, screening, and follow-up. Abbreviations: CRP, C-reactive protein; PFT, pulmonary function testing; RBT, routine blood test. We enrolled patients who were at least 40 years old diagnosed with COPD and in stable stage of disease with the severity from moderate to very severe. 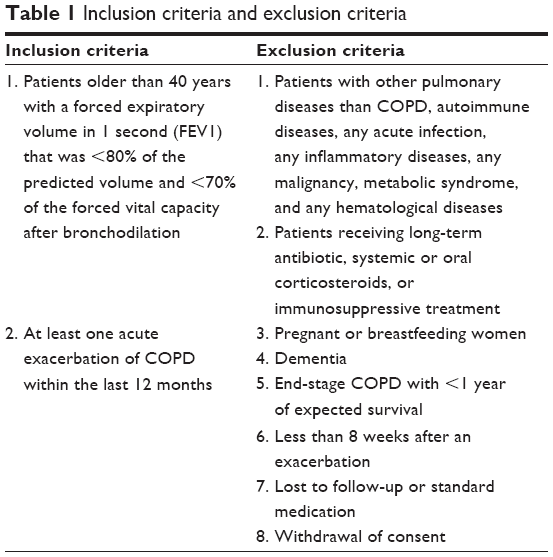 The diagnostic criteria were defined as a forced expiratory volume in 1 second (FEV1) that was <80% of the predicted volume and <70% of the forced vital capacity after bronchodilation and a history of at least one documented exacerbation in the past 12 months before screening.15 The subjects in the control group were healthy people who were older than 40 years with or without smoking history. At each participating center, the RBT, pulmonary function test, BODE index, erythrocyte sedimentation rate (ESR), C-reactive protein (CRP), and procalcitonin in blood were measured for the COPD group at the enrollment, meanwhile, the RBT was assayed for the healthy control group. During the 24-month study period, all subjects were followed up on schedule once in every 3 months. 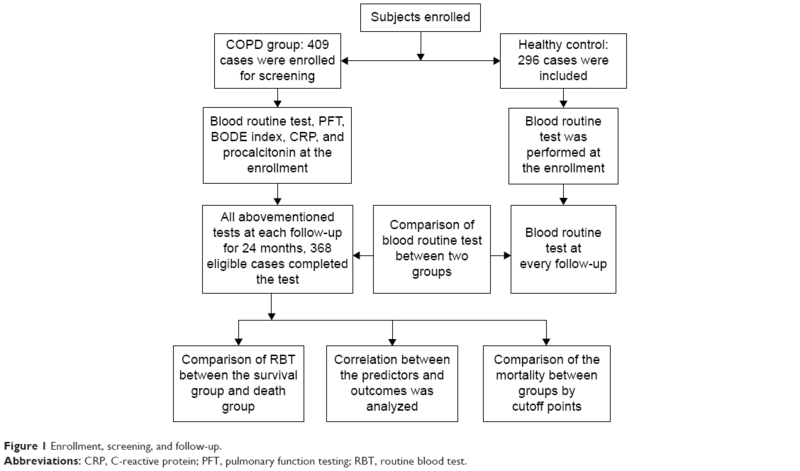 At every follow-up, the RBT, pulmonary function test, BODE index, ESR, CRP, and procalcitonin were performed again for every subject in the COPD group. For subjects in the control group, RBT was the only checkup during the follow-up. The end point was the end of the study or the death of patients. At the end point of the study, the exacerbation count was recorded. Survival rate and exacerbation rate were calculated once in every month. After the collection of all databases, the differences among the parameters such as WBC, RBC, neutrophil, lymphocyte, eosinophil, basophil, NLR, EBR, RDW, Hb, and platelet (PLT) in RBT between the COPD group and those of healthy group were compared. For the next step, after subjects in the COPD group were stratified into survival group and death group according to the outcome of patients, the parameters in RBT between the two groups were compared. Then, the correlation between all the prognostic markers throughout the whole follow-up, such as BODE index, Global Initiative for Chronic Obstructive Lung Disease (GOLD) stage, previous exacerbation count, RBT, CRP, procalcitonin, ESR, and the mortality of patients, was analyzed for the COPD group. For the parameters in RBT, which were most positively or negatively correlated with the mortality, the cutoff points were analyzed. According to the cutoff points, we stratified the subjects into the parameter-positive group and parameter-negative group, and then the mortality incidence and exacerbation counts were compared between the corresponding groups. All the COPD patients received standard medication in accordance to the GOLD guidelines during the follow-up.16 In this study, all the COPD subjects received Spiriva Respimat for daily therapeutic management. Those subjects who were lost to follow-up or received standard medication were excluded. Exacerbation was defined as an event in the natural course of the disease characterized by a change in the patient’s baseline dyspnea, cough, and/or sputum, which is beyond normal day-to-day variations, is acute in onset, and may warrant a change in medication in a patient with underlying COPD.16 Mortality was defined as death that resulted from COPD or its comorbidities. The deceased who died from other reasons were excluded from the mortality cohort. The exacerbation incidence was defined as the number of patients who had at least one exacerbation divided by the number of all patients in every month. NLR was defined as the absolute neutrophil count divided by the absolute lymphocyte count. The EBR was defined as the absolute eosinophil count divided by the absolute basophil count. The blood analyzer used in all the centers for this study was DxH 800 blood analyzer (Beckman Coulter, Inc., Brea, CA, USA). The spirometer used in all centers for this study was Jaeger Masterscreen spirometer (Jaeger, Inc., Bodnegg, Germany). The trial was performed in accordance with the provisions of the Declaration of Helsinki, and the study protocol was approved by the ethics review board at each institution. All patients who were enrolled in this study signed their written informed consent. All the authors worked collaboratively to prepare the final content and made the decision of submission as well as the publication. Measurement data are presented as mean ± standard deviation or median with interquartile range according to whether they conform to normal distribution. Categorical data are presented as frequencies and percentages. Comparison of continuous variables between two groups was performed using an unpaired t-test. We performed both univariate and multivariate logistic regression analyses to calculate odds ratios (ORs) and 95% confidence intervals (CIs) for each parameter as a continuous variable. In addition, we used the Kaplan–Meier method to estimate the probability of COPD exacerbation and mortality. Statistical significance was accepted at P<0.05. All statistical analyses were performed using SPSS 19 software (SPSS Inc., Chicago, IL, USA) and R package version 3.0.2. (Free Software Foundation, Inc, Boston, MA, USA). A total of 409 patients underwent the enrollment and screening. At the end point of study, 368 cases of COPD patients who were eligible completed the study. A total of 68.5% of the patients were men; the mean age was 70.6 years. The cases in moderate, severe and very severe stages were 86, 124 and 158, respectively. The baseline characteristics of the patients and the use of respiratory medications were similar in the COPD group. The main characteristics of the subjects at baseline are shown in Table 2. Note: Data presented as mean ± standard deviation, unless otherwise indicated. Abbreviations: EBR, eosinophil to basophil ratio; ESR, erythrocyte sedimentation rate; FEV1, forced expiratory volume in 1 second; GOLD, Global Initiative for Chronic Obstructive Lung Disease; MMRC, Modified Medical Research Council; NLR, neutrophil to lymphocyte ratio; RDW, red cell distribution width. After all the follow-ups being done, the overall comparison of RBT between COPD group and control group throughout the whole study was performed. It was discovered in our study that there were some significant differences about several parameters of RBT between COPD group and control group. 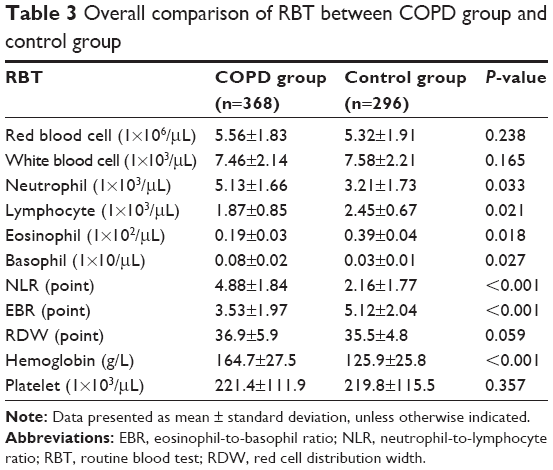 The NLR (P<0.001), neutrophil and basophil in COPD group were higher than those of the control group with statistical difference. However, the EBR (P<0.001), eosinophil, and lymphocyte in COPD group were lower than those of the control group. There was no statistical difference between two groups among Hb, RBC, RDW, or PLT. The detailed information are shown in Table 3. Abbreviations: EBR, eosinophil-to-basophil ratio; NLR, neutrophil-to-lymphocyte ratio; RBT, routine blood test; RDW, red cell distribution width. According to the outcome of COPD patients, all subjects in COPD group were stratified into survival group and death group. The results showed that the NLR (P<0.001), neutrophil, and basophil of the survival group were lower than those of the death group, meanwhile, the eosinophil, lymphocyte, Hb, and EBR (P<0.001) of the survival group were higher than those of the death group throughout the whole study. There was no difference among WBC, RBC, RDW, or PLT between two groups. The detailed results are shown in Table 4. At the end of the study, for all the subjects in COPD group, there were 96 patients who died of COPD. Among all the deceased COPD patients, the cases in moderate, severe, and very severe stages were 7, 33, and 56, respectively. To our surprise, after the analysis of the correlation between all prognostic factors throughout the whole follow-up and the mortality of patients with both univariate and multivariate analyses, we found out among all the hazardous predictors for a death, the NLR was the most relevant one (univariate: OR =3.58, P<0.001; multivariate: OR =3.95, P<0.001). The top three factors that positively correlated with mortality were NLR, BODE index, and previous exacerbation count. Meanwhile, among all the protective predictors for a death, the EBR was the most relevant one (univariate: OR =0.56, P<0.001; multivariate: OR =0.32, P<0.001). The top three factors that negatively correlated with mortality were EBR, Hb, and FEV1 volume, respectively. The results of our study also showed that CRP was positively correlated with the mortality, while procalcitonin was not. However, compared with that of NLR or EBR, the relevance of CRP to mortality was inferior. What’s more, no relationship was found for ESR. The detailed information is displayed in Tables 5 and 6. We also conducted receiver operating characteristic (ROC) curve to obtain cutoff point of NLR and EBR for the prediction of mortality. The results of our study indicated that for NLR, the specificity and sensitivity were 89.7 and 85.8, respectively, when cutoff point was 3.3 with area under the curve (AUC) of 0.91. The NLR ≥3.3 was considered to be an independent predictor for mortality. As for EBR, the specificity and sensitivity were 88.1 and 85.3, respectively, when cutoff point was 4.2 with AUC of 0.89. The EBR ≤4.2 was considered to be an independent predictor for mortality. The results of ROC curve are displayed in Figure 2. Abbreviations: BMI, body mass index; CRP, C-reactive protein; EBR, eosinophil-to-basophil ratio; ESR, erythrocyte sedimentation rate; FEV1, forced expiratory volume in 1 second; GOLD, Global Initiative for Chronic Obstructive Lung Disease; MMRC, Modified Medical Research Council; NLR, neutrophil-to-lymphocyte ratio; RBC, red blood cell; RDW, red cell distribution width; WBC, white blood cell; 6MWD, 6-minute walk distance. Abbreviations: BMI, body mass index; CRP, C-reactive protein; EBR, eosinophil-to-basophil ratio; ESR, erythrocyte sedimentation rate; FEV1, forced expiratory volume in 1 second; GOLD, Global Initiative for Chronic Obstructive Lung Disease; h, hour; MMRC, Modified Medical Research Council; NLR, neutrophil-to-lymphocyte ratio; RBC, red blood cell; RDW, red cell distribution width; WBC, white blood cell; 6MWD, 6-minute walk distance. Figure 2 Receiver operating characteristic (ROC) curve of NLR for the prediction of mortality (left); ROC curve of EBR for the prediction of mortality (right). Abbreviations: AUC, area under the curve; CI, confidence interval; EBR, eosinophil-to-basophil ratio; NLR, neutrophil-to-lymphocyte ratio. According to the cutoff point of NLR, all subjects of COPD group were stratified into high NLR group (n=202) and low NLR group (n=166). After the comparison of exacerbation count and survival rate between the two groups, we found that the exacerbation count of high NLR group was higher than that of low NLR group (P=0.006); meanwhile, the survival rate of high NLR group was lower than that of low NLR group (P<0.001). The detailed results are displayed in the Kaplan–Meier plot (Figure 3). Figure 3 Comparison of survival rate between high NLR group and low NLR group (left); comparison of exacerbation rate between high NLR group and low NLR group (right). Notes: ○, high NLR group; •, low NLR group. According to the cutoff point of EBR, all subjects of COPD group were stratified into high EBR group (n=178) and low EBR group (n=190). After the comparison of exacerbation count and survival rate between the two groups, we found that the exacerbation count of high EBR group was lower than that of low EBR group (P<0.001); meanwhile, the survival rate of high EBR group was higher than that of low EBR group (P=0.005). The detailed results are displayed in the Kaplan–Meier plot (Figure 4). 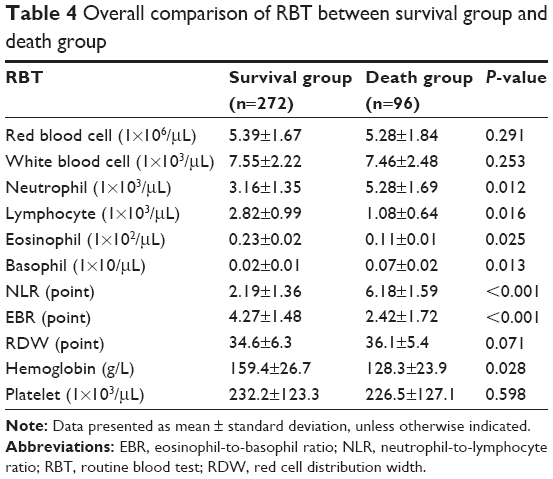 Figure 4 Comparison of survival rate between high EBR group and low EBR group (left); comparison of exacerbation rate between high EBR group and low EBR group (right). Notes: ○, low EBR group; •, high EBR group. In our study, COPD patients were followed up and predicted with biomarkers in RBT for their prognosis. In this perspective follow-up study, the prognostic factors such as NLR and EBR in RBT were found to be useful markers for the prediction of prognosis and assessment of the severity in patients with COPD. First, we found that the NLR, neutrophil, and basophil in COPD group were higher than those of the control group, meanwhile, the EBR, eosinophil, and lymphocyte in COPD group were lower than those of the control group. Second, the NLR, neutrophil, and basophil of the survival group were lower than those of the death group, meanwhile, eosinophil, lymphocyte, Hb, and EBR of the survival group were higher than those of the death group. Third, we found that the most correlated prognostic markers with mortality of COPD were NLR and EBR. Fourth, we found that the exacerbation count of high NLR group was higher than that of low NLR group, meanwhile, the survival rate of high NLR group was lower than that of low NLR group. Finally, we found that the exacerbation count of high EBR group was lower than that of low EBR group, meanwhile, the survival rate of high EBR group was higher than that of low EBR group. In our study, we confirmed that neutrophil and lymphocyte are independently correlated with mortality; however, their relevance is not as much as that of NLR. Interestingly, similar to our study, Lee et al found that although neither neutrophil nor lymphocyte alone was correlated with FEV1; however, the NLR was correlated with FEV1. It is therefore reasonable to postulate that the NLR, which integrates neutrophilia as an indicator of inflammation and lymphopenia as an indicator of decreased immune competence or poorer general health, reflects the severity and activity of COPD better than neutrophilia or lymphopenia does alone.9 The combination of neutrophils and lymphocytes in a single composite indicator can potentially provide more powerful information, regarding the clinical status of COPD patients than a single parameter alone.8 It provides information beyond that of a complete white blood cell count due to high neutrophil granulocyte count reflecting systemic inflammation and lymphopenia reflecting immune competence,7 since systemic inflammation and compromised immunological function are the true essence of COPD. There is some suggestion that subjects with lower eosinophil (<2%) have more severe COPD and/or comorbidities, but the clinical importance is not fully understood. In a longitudinal analysis of the ECLIPSE cohort, COPD patients with persistent eosinophilia (>2%) had significantly higher FEV1% predicted and fat-free mass, lower St George’s Respiratory Questionnaire (SGRQ) and Modified Medical Research Council Dyspnea scores.32 A greater progression of emphysema and worsening in SGRQ score were observed in patients with persistent lower eosinophil counts. 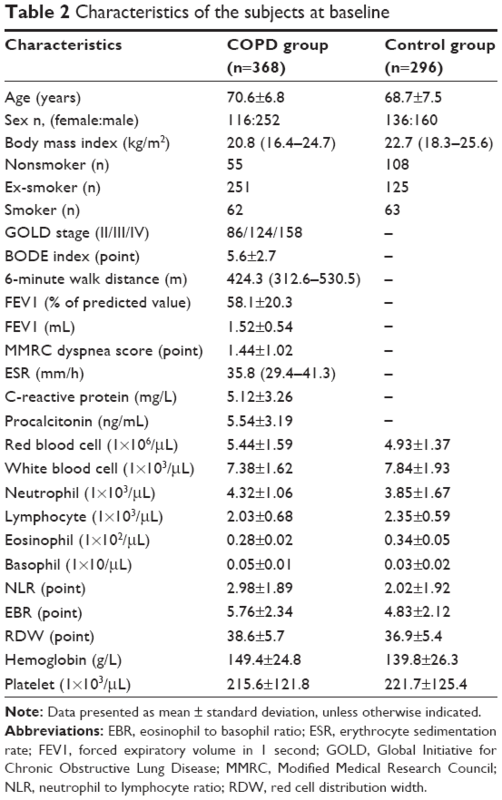 In the SPIROMICS study, subjects with lower baseline eosinophil (<1%) had more severe COPD, evidenced by a greater degree of obstruction, shorter 6-minute walk distances (6MWDs) and higher numbers of exacerbations and were more commonly in GOLD stage III or IV.33 It is also interesting to realize that the eosinophil is the most steroid-sensitive cell in the airways.21 In stable COPD, it has been shown that higher number of eosinophils correlates with responsiveness to both oral and inhaled corticosteroids.34 A previous study showed that in the outpatient treatment of exacerbations of COPD, systemic corticosteroids should only be given to those who have a peripheral blood eosinophil count >2%,35 blood eosinophil levels represent a potentially important biomarker that could aid treatment decision making in patients with moderate-to-severe COPD.36 The results of our study conformed to those of previous studies. In addition, in this study, we invented a new indicator, which was EBR and was negatively related to mortality. Since this is the first study that involves EBR, we do not have any previous study to refer to, however, as it was expected, it plays a protective role in the prognosis of COPD and demonstrates more accurate predictive power than each one of eosinophil or basophil does. For its interpretation, we speculate that maybe there is some mechanism that links eosinophil or basophil to the corticosteroids level of COPD patients making it possible to reflect the probability of mortality. This still remains ambiguous requiring further elucidation. Although Tertemiz et al14 demonstrated that elevated RDW levels in patients with COPD were associated with disease severity and lower survival rates due to increased RDW levels might be an indicator of hypoxemia, underlying inflammation and oxidative stress in COPD patients, out of our reckoning, we did not find any relationship between RDW and the prognosis of the disease. We speculated that the interpretation of this phenomenon maybe lied in that the variation of RDW merely reflected the consistency of size and shape of erythrocyte more than the oxygen-carrying capacity. Nevertheless, to our surprise, we discovered that Hb was correlated with the mortality of COPD. Most previous studies did not describe a relationship between the prevalence of anemia and the severity of the COPD, nevertheless, Watz et al37 found that the prevalence of anemia was higher in patients with very severe COPD (14%). Zilz et al’s study showed that lower Hb and hematocrit (Hc) levels were linked to higher depression values. Accordingly, they found in a large retrospective analysis that in patients with chronic respiratory failure, irrespective of the underlying etiology, anemia was independently related to dyspnea.38 Similar data were obtained by Cote et al39 who investigated 683 stable COPD outpatients and found that anemic patients showed a significantly higher Modified Medical Research Council score than nonanemic patients. As good as our speculation, Similowski et al40 deemed that the efficiency of gas exchange depends on Hb levels, which could worsen exercise capacity if they fall. For another two biomarkers that are always discussed with inflammation, both CRP and procalcitonin were included in our study. A previous study has shown that the NLR can predict bacteremia or the severity of community-acquired pneumonia with a higher prognostic accuracy than traditional infection parameters, including CRP.8 Our finding suggests that although its relevance to mortality is inferior to that of NLR or EBR, CRP is still correlated with mortality in contrast to procalcitonin. Coincidentally, Soler et al41 indicated that CRP, but not PCT, may be a useful parameter to increase confidence of the absence of bacterial bronchial infection. Moreover, similar to the previous study of Corsonello, our study showed that ESR is not qualified as the reliable marker for COPD severity,42 possibly due to its nonspecificity to any specific disease. In addition, BODE index, previous exacerbation count, and FEV1 volume were also found to be highly related to mortality of COPD, however, they are beyond the scope of our discussion. To sum up, it appears that neutrophil and basophil are hazardous factors for the prognosis of COPD, while eosinophil and lymphocyte are the protective ones. Compared with the each one of neutrophil, lymphocyte, eosinophil, and basophil as a single factor, NLR or EBR demonstrated more powerful prognostic capacity. Compared with other prognostic indicators such as BODE index, GOLD stage, FEV1, MMRC, 6MWD, or exacerbation count, which are likely influenced by the subjective effort, perception, or memory of patients, NLR and EBR are more objective in reflecting their condition. Our study has both strengths and limitations. First, as far as we know, this is the first study that concerns the prediction of prognosis of COPD with comprehensive prognostic indicators in RBT. In addition, EBR was never mentioned in previous studies. Second, as the inflammation of COPD is systemic, we preferred choosing the parameters in blood than those in sputum. Third, we carried out the study stringently in accordance with the inclusion and exclusion criteria. This may explain why there were some dropouts in the COPD cohort. Nevertheless, there was still certain imperfection in this study. First, although some of the conditions were adjusted as possible as we could, we might not have completely excluded all the confounding factors that might influence the NLR. Second, most of the subjects included in the study were males and ever-smokers since male patients and smokers account for a major proportion in COPD patients. Accordingly, our results may not be applicable to females or never smokers. Third, we chose COPD patients with severity from moderate to very severe as the subjects due to exacerbation count is few for patients at mild stage. Therefore, the results may not be completely applicable for this type of patients. The results from this study show that the NLR and EBR in RBT have a significant correlation with the prognosis and severity of patients with COPD. The NLR ≥3.3 is an independent predictor for mortality and the EBR ≤4.2 is an independent predictor for mortality. RBT is the most elementary and simple assay, which is considered to provide minimal information. However, just like Lao tzu of Taoism said, “less is more”. Therefore, the RBT, which is an inexpensive, accessible and convenient assay, may be applied as a practical means for the prediction of prognosis of patients with COPD in future clinical settings, especially in primary health care. Further study focusing on large scale of population is highly recommended. The authors thank all the subjects who are enrolled in this study. Woodruff PG, Agusti A, Roche N, et al. Current concepts in targeting COPD pharmacotherapy: making progress towards personalized management. Lancet. 2015;385(9979):1789–1798. Wain LV, Shrine N, Miller S, et al; UK Brain Expression Consortium (UKBEC); OxGSK Consortium. Novel insights into the genetics of smoking behavior, lung function, and chronic obstructive pulmonary disease (UK BiLEVE): a genetic association study in UK Biobank. Lancet Respir Med. 2015;3(10):769–781. Vogelmeier C, Hederer B, Glaab T, et al; POET-COPD Investigators. Tiotropium versus Salmeterol for the prevention of exacerbations of COPD. N Engl J Med. 2011;364(12):1093–1103. Ito K, Ito M, Elliott WM, et al. Decreased histone deacetylase activity in chronic obstructive pulmonary disease. N Engl J Med. 2005;352(19):1967–1976. Lee SJ, Lee HR, Lee TW, et al. Usefulness of neutrophil to lymphocyte ratio in patients with chronic obstructive pulmonary disease: a prospective observational study. Kor J Intern Med. 2016;31(5):891–898. Guany E, Saric Ulasli S, Akar O, et al. Neutrophil-to-lymphocyte ratio in chronic obstructive pulmonary disease: a retrospective study. Inflammation. 2014;37(2):374–380. Sørensen AK, Holmgaard DB, Mygind LH, et al. Neutrophil-to-lymphocyte ratio, calprotectin and YKL-40 in patients with chronic obstructive pulmonary disease: correlations and 5-year mortality – a cohort study. J Inflamm (Lond). 2015;12:20. Furutate R, Ishii T, Motegi T, et al. The neutrophil to lymphocyte ratio is related to disease severity and exacerbation in patients with chronic obstructive pulmonary disease. Intern Med. 2016;55(3):223–229. Lee H, Um S-J, Kim YS, et al. Association of the neutrophil-to-lymphocyte ratio with lung function and exacerbations in patients with chronic obstructive pulmonary disease. PLoS One. 2016;11(6):e0156511. Kim YJ, Lim B, Kyung SY, Park JW, Jeong SH. Comorbidity and inflammatory markers may contribute to predict mortality of high-risk patients with chronic obstructive pulmonary disease exacerbation. J Clin Med Res. 2016;8(7):531–536. Saha S, Brightling CE. Eosinophilic airway inflammation in COPD. Int J COPD. 2006;1(1):39–47. Saltürk C, Karakurt Z, Adiguzel N, et al. Does eosinophilic COPD exacerbation have a better patient outcome than non-eosinophilic in the intensive care unit? Int J COPD. 2015;10:1837–1846. Kaveri SV, Mouthon L, Bayry J. Basophil and nephritis in lupus. N Engl J Med. 2010;363(11):1080–1082. Tertemiz KC, Ozgen Alpaydin A, Sevinc C, et al. Could “red cell distribution width” predict COPD severity? Rev Port Pneumol. 2016;22(4):196–201. Magnussen H, Disse B, Rodriguez-Roisin R, et al; WISDOM Investigators. Withdrawal of inhaled glucocorticoids and exacerbations of COPD. N Engl J Med. 2014;371(14):1285–1294. Global Initiative for Chronic Obstructive Lung Disease (GOLD). Global Strategy for the Diagnosis, Management and Prevention of Chronic Obstructive Pulmonary Disease. 2016. Available from: http://goldcopd.org/global-strategy-diagnosis-management-prevention-copd-2016. Accessed December 1, 2016. Walter RE, Wilk JB, Larson MG, et al. Systemic inflammation and COPD: the Framingham Heart Study. Chest. 2008;133(1):19–25. Dahl M, Vestbo J, Lange P, Bojesen SE, Tybjaerg-Hansen A, Nordestgaard BG. C-reactive protein as a predictor of prognosis in chronic obstructive pulmonary disease. Am J Respir Crit Care Med. 2007;175(3):250–255. Thomsen M, Dahl M, Lange P, Vestbo J, Nordestgaard BG. Inflammatory biomarkers and comorbidities in chronic obstructive pulmonary disease. Am J Respir Crit Care Med. 2012;186(10):982–988. Boschetto P, Quintavalle S, Zeni E, et al. Association between markers of emphysema and more severe chronic obstructive pulmonary disease. Thorax. 2006;61(12):1037–1042. Bathoorn E, Kerstjens H, Postma D, Timens W, MacNee W. Airways inflammation and treatment during acute exacerbations of COPD. Int J COPD. 2008;3(2):217–229. Rovina N, Koutsoukou A, Koulouris NG. Inflammation and immune response in COPD: where do we stand? Mediators Inflamm. 2013;2013:413735. O’Donnell R, Breen D, Wilson S, et al. Inflammatory cells in the airways in COPD. Thorax. 2006;61(5):448–454. Brusselle GG, Joos GF, Bracke KR. New insights into the immunology of chronic obstructive pulmonary disease. Lancet. 2011;378(9795):1015–1026. Chung KF, Adcock IM. Multifaceted mechanisms in COPD: inflammation, immunity, and tissue repair and destruction. Eur Respir J. 2008;31(6):1334–1356. Demedts IK, Morel-Montero A, Lebecque S, et al. Elevated MMP-12 protein levels in induced sputum from patients with COPD. Thorax. 2006;61(3):196–201. Vestbo J, Hurd SS, Agusti AG, et al. Global strategy for diagnosis, management, and prevention of chronic obstructive pulmonary disease: GOLD executive summary. Am J Respir Crit Care Med. 2013;187(4):347–365. Hogg JC, Chu F, Utokaparch S, et al. The nature of small-airway obstruction in chronic obstructive pulmonary disease. N Engl J Med. 2004;350(26):2645–2653. Retamales I, Elliott WM, Meshi B, et al. Amplification of inflammation in emphysema and its association with latent adenoviral infection. Am J Respir Crit Care Med. 2001;164(3):469–473. Van der Strate BW, Postma DS, Brandsma CA, et al. Cigarette smoke induced emphysema: a role for the B cell? Am J Respir Crit Care Med. 2006;173(7):751–758. Gosman MM, Willemse BW, Jansen DF, et al. Increased number of B-cells in bronchial biopsies in COPD. Eur Respir J. 2006;27(1):60–64. Singh D, Kolsum U, Brightling CE, et al; ECLIPSE Investigators. Eosinophilic inflammation in COPD: prevalence and clinical characteristics. Eur Respir J. 2014;44:1697e1700. Weir M, Zhao H, Han MK, et al. Eosinophils in chronic obstructive pulmonary disease, the SPIROMICS cohort. Am J Respir Crit Care Med. 2014;189:A5902. Brightling CE, McKenna S, Hargadon B, et al. Sputum eosinophilia and the short term response to inhaled mometasone in chronic obstructive pulmonary disease. Thorax. 2005;60(3):193–198. Bafadhel M, McKenna S, Terry S, et al. Blood eosinophils to direct corticosteroid treatment of exacerbations of chronic obstructive pulmonary disease. A randomized placebo-controlled trial. Am J Respir Crit Care Med. 2012;186(1):48–55. Pavord ID, Lettis S, Locantore N, et al. Blood eosinophils and inhaled corticosteroid/long acting β-2 agonist efficacy in COPD. Thorax. 2016;71(2):118–125. Watz H, Waschki B, Boehme C, et al. Extrapulmonary effects of chronic obstructive pulmonary disease on physical activity. Am J Respir Crit Care Med. 2008;177(7):743–751. Zilz C, Blaas SH, Pfeifer M, Jörres RA, Budweiser S. Mental health, serum biomarkers and survival in severe COPD: a pilot study. Multidiscip Respir Med. 2016;11:3. Cote C, Zilberberg MD, Mody SH, Dordelly LJ, Celli B. Haemoglobin level and its clinical impact in a cohort of patients with COPD. Eur Respir J. 2007;29(5):923–929. Similowski T, Agustí A, MacNee W, Schönhofer B. The potential impact of anaemia of chronic disease in COPD. Eur Respir J. 2006;27(2):390–396. Soler N, Esperatti M, Ewig S, et al. Sputum purulence-guided antibiotic use in hospitalized patients with exacerbation of COPD. Eur Respir J. 2012;40(6):1344–1353. Corsonello A, Pedone C, Battaglia S, Paglino G, Bellia V, Incalzi RA. C-reactive protein (CRP) and erythrocyte sedimentation rate (ESR) as inflammation markers in elderly patients with stable chronic obstructive pulmonary disease (COPD). Arch Gerontol Geriatr. 2011;53(2):190–195.